Saxon I TV / BR 98.0 "Kreuzspinne"
This locomotive building type Meyer is a two-bogie locomotive, at which the high- and low pressure cylinder were placed to each other. The saxon I TV was once built by Hartmann for the sinous „Windbergbahn“ near Dresden. The first two engines has been delivered in 1890 and 1891. In the years 1910 to 1914 further 18 locomotives of the strenghtened model followed. 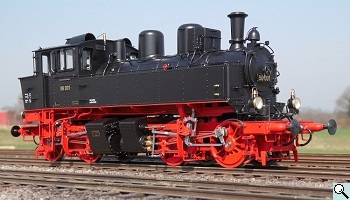 The type was not without problems in view of running smoothness and also the steam feeding caused problems. Nevertheless several engines were based in the depot Dresden-Altstadt till the rejection in 1967. Vernacular the locomotive was called „Kreuzspinne“. During test runs, the model was running successful through 1020mm radius. The specialised journalist Peter Pernsteiner has within the scope of a test report about our type 98.0, for the Eisenbahnmagazin-Edition 6/2018, created a nice YouTube-Video, that we wanted to show you here. In the following movie, which also has been created by Peter Pernsteiner, you can see the BR 98.0 in action on the Gauge-1-Module-Meeting in Lauingen.